Kimchi. You cannot claim to be Korean if you don’t know what it is. It’s a side dish that is in every Korean home and restaurant. Its history dates back thousands of years to the time of the Three Kingdoms. Although, they say it found its spiciness relatively recently in the 17th century. Portuguese traders brought chilli from the Americas and before long, it was being used in the dish. For the uninitiated, modern kimchi is usually cabbage fermented in chilli powder and a few other ingredients. It’s red, pungent and spicy. I wish I knew those other ingredients. I’ve asked my mother a few times to tell me her recipe, but she always fobs off my questions. “Why on earth do you want to make your own, when you can buy it so easily? Save yourself the work,” she insists. I hope to convince her to tell me one day. There are so many fake recipes floating around the internet and I’ve had a few Australian friends, genuinely interested in making their own, ask me how to make it. When I push her for the recipe, my mother’s answer is always vague. Meanwhile, her kimchi is delicious. When kimchi becomes old, it sours. That’s when it’s used for stew. This, I know how to make. Although it’s never quite as good as mum’s. I fry up some pork with the kimchi before adding water or stock. As the soup starts to bubble away, I throw in some vegetables and tofu. Easy. The only problem is that I’m the only one who eats it. My husband hails from the land of sausages and chips. Of backyard barbecues and iceberg lettuce salads. The sweet man tries to enjoy my kimchi hotpot, but I see him struggling. Spicy food traumatises our son. So do vegetables. Therefore spicy fermented cabbage stew is his worst nightmare come to life. I find myself eating kimchi hotpot less and less these days. Pies, steak, sausages and pasta seem to dominate the dinner menu. 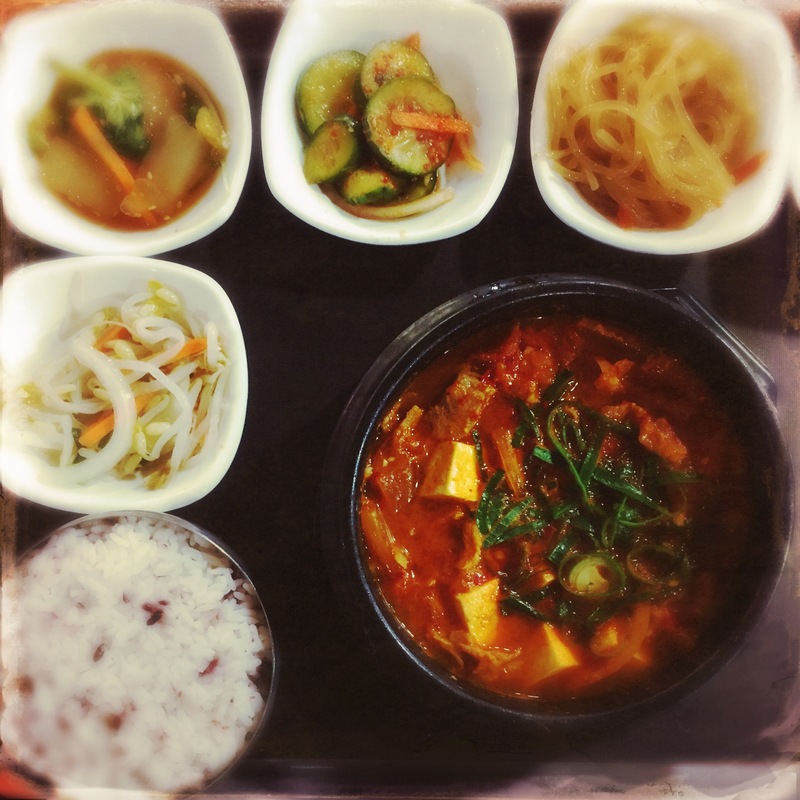 But occasionally, when the craving gets too much, I drag my family to the local Korean restaurant and eat my fill of the delicious stew. Your mother’s vague answers to how to make kimchi brought a smile. My family also has variations on her response when I ask about traditional recipes. Until you crack her code, enjoy your kimchi outings. I shall. Thank you. She is a tough nut to crack! I don’t think I’ve ever had Korean food, I’m glad you opened the window for me. My husband is not a fan of Kimchi too or any spicy food. I like Kimchi in my bibimbap.